Retraining of Racehorses (RoR) and British Showjumping are pleased to announce that retrained racehorse, Nettis an 6 year-old chestnut gelding owned and ridden by 33 year-old Charlotte Kerton from Newmarket, Suffolk is a winner of the 2014 British Showjumping Retraining of Racehorses Regional Recognition Award. Racegoers saw Nettis make nine starts during his time on the track and Charlotte first rode him back when he was race training as a 2 year-old. Nettis’ last race was in September 2011 and since being out of race training, Charlotte has focused on improving both his flatwork and showjumping with help from UKCC Coach Mia Korenika. Charlotte has also been using the NAF Horse Five Star Performance Awards Programme to support his development. Charlotte was delighted to hear that Nettis has won an award “I’m so pleased for Nettis, he is a fantastic and genuine horse who enjoys his showjumping and the Club competitions have been an excellent introduction into the sport for him. These awards provide a focus for ex-racehorses that are showjumping at Club level. 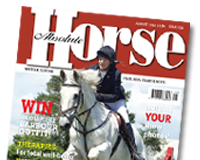 A product sponsorship is awarded to the highest placed horse in each region with Club League points and a winner from each region is identified by selecting the highest placed eligible horse with points in the 1.00m section. If none qualify, it will move to the highest placed eligible horse in the 0.90cm section, working downwards until a horse is identified. Each regional award winner will receive an embroidered jacket and rug. British Showjumping Club Membership costs just £30 per year and it was launched back in 2011 to give competitors the chance to compete between 0.70cm – 1.00m. Competitions are run over 0.70cm, 0.80cm, 0.90cm and 1.00m courses and entries fees are capped at just £10.